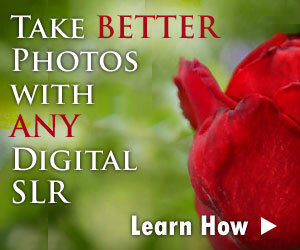 Adding more flash to your digital SLR camera can become very expensive, very fast. Once you start looking at the alternative flash options available for your digital SLR camera, you'll quickly realize that there are hundreds of different ways to light a subject, and hundreds of different products that can get the job done. Those of you who don't want to spend a fortune to get good results need not despair — there are plenty of low-cost solutions out there. You just have to get creative with what you use. You'll also have to accept that your flash won't be as powerful, portable or flexible as some of the more expensive setups. In the paragraphs that follow, I'll introduce you to a variety of different flash packages in increasing order of price. I'll describe the components of each package to you, and talk about some of the limitations of each one. By the time you're done, you should have a very good idea of what sort of results you can achieve with each package, and how much it's going to set you back. The easiest way to find the right flash package for your digital SLR camera is to answer this question: what do you want to photograph with flash? The needs of an eBay product photographer are going to be quite different from those of an on-location family portrait photographer. Of course, you can make any one of the flash packages below work for your needs - but the point here isn't just to find something that will light up your subject, but something that will FLATTER your subject. While you can get away with a single small flash to brighten shadows on a sunny day, a multiple flash setup will help you capture more dramatic portraits. What subject will you photograph with flash most often? Will your subjects be in motion or static? Will you use your flash in a controlled (studio) environment or on location (the wild outdoors)? Do you want your flash on the camera or off of it? If the flash is off the camera, how do you want to set it off (wired or wireless)? Do you want to control the output of the flash manually or automatically? Having at least a vague answer to these questions will help immensely when you start taking a closer look at some of the digital SLR flash packages I've put together below. You''ll also need a pretty good working knowledge of the flash options and accessories that are available. If you haven't already done so, I encourage you to read through the SLR flash glossary for more information. Ready to get started? Let's begin with a cheap yet versatile flash option. Special Note: the digital SLR flash gear listed below doesn't include every possible make and model. Instead, the items that I list on this page are ones that I use myself, or they're widely recognized as high-quality components by other reviewers. If you're just getting started in the world of digital SLR flash, there's no real need to spend a ton of money to add some artificial light to your photos. That's why we'll begin with an inexpensive setup that - under the right conditions - can yield some impressive results. Many of the less expensive digital SLR cameras don't include a PC sync port: this port allows you to connect cables to external flash units. More advanced cameras like the Canon 40D and Pentax K20D do have PC ports, so no adaptor is required. For cameras without the port, you just need to get an adaptor that fits onto your camera's hot shoe and provides the camera with a PC port. Now that you've got a PC port on the camera, you'll need a flash unit. The Vivitar 285HV is a real workhorse flash, used extensively by many professional photographers. It's quite powerful, and has a fast recycle time when you don't use it at full power. Simply put, you get a lot of flash for what you pay for here, with one potentially large limitation: you must set the power output of the flash manually. This should be of no concern to you if you intend to use the flash under controlled conditions, with subjects that aren't moving all over the place. The problem with moving subjects is that as they move closer to the flash, you have to keep dialing down the power (or changing your camera's exposure settings) to get a photo that's not washed out. The problem with variable light conditions is the same: as the light changes, you must constantly adjust the power of the flash to get consistent results. If you're OK with the idea of an all-manual flash, then the only remaining step is to connect the PC port to the flash with a PC to Vivitar sync cord. If you're worried that you just won't get good results with a flash that you set manually, you need not be: that's the beauty of working with a digital camera. Start out with your best guess about the power output of the flash and your camera settings, take a test photo, then make adjustments (to either camera or flash) to get just the results you want. Once you have the right exposure dialed in, you should not have to change the settings all that much for future shots. The light stand and umbrella bracket are essential items if you don't want to always have to hold the flash in your hand. The umbrella bracket sits on top of the light stand and acts as a bridge, connecting the flash to the stand. Once the flash is set up on the stand, you can move it anywhere you like (depending upon the length of your PC sync cord) which gives you tons of options for lighting your subject. While economical and versatile, this first flash package does come with a limitation: it's very hard to use with a subject that's moving all over the place. This is especially true if you opt to get the extras, and have the flash attached to a stand with an umbrella. In this case, hauling the setup around to keep pace with a moving subject is difficult. However, if you typically photograph subjects who can stay still, and want a nice beginning flash setup that is portable (once disassembled), then this package is worth considering. The next step up from the inexpensive package is a manufacturer-specific flash that connects directly to your camera's hot shoe. These flash units must be attached to the camera's hot shoe, which limits your control over the direction of light (it can't illuminate your subject from the side or rear). However, the big benefit is that these flash units communicate directly with your digital SLR and can be used in full auto mode to add just the right amount of flash to any subject. The flash units listed above are all camera-specific: this means that you shouldn't use the Canon 430EX on a Nikon digital SLR camera. They are also not the most expensive units offered by each manufacturer. Instead, I've selected the units that offer good light output for a (relatively) reasonable amount of money. The setup for any one of these flash units is quite simple: just attach the flash to the hot shoe on the top of your camera. No wires, cords, tripods or other accessories are required. The main benefit of using an on-camera flash is that the flash can move with you. Unlike the other setups on this page where you're tethered to a flash that's hard to move, with a flash sitting on top of the camera, you can run after a moving subject, firing the flash every step of the way. (This explains why all paparazzi use these types of flash units with their cameras). Another pro of using a manufacturer-specific flash is that it plays nice with your camera. In the same way that your lens can communicate available light information to your camera, the electronic connection between camera and flash provides the flash with information about the focal length of your lens and the lens aperture you're using. This additional information allows the flash to put out just the right amount of light to illuminate your subject - and you don't have to fiddle with a single manual control. All of the flashes listed above DO offer manual controls in addition to their AUTO modes, so you can set the flash yourself if you so desire. Since these external flash units must be tethered to the camera's hot shoe, there aren't a lot of accessories that you can use them with — light stands, umbrellas and reflectors are out of the question. A flash extension cord will allow you to move the flash off of the camera - not a great distance away, but enough to allow you to point the flash in several directions. For Canon digital SLRs there's the OC-E3 off-camera shoe cord ($70), and for Nikon you can get an SC-29 sync extension cord ($75). You can pair a flash extension cord with a flash bracket: you attach your digital SLR to one plate of the bracket and - with the extension cord in between - you attach the flash to another part of the bracket. This allows you to place the flash in a variety of positions away from the camera without having to hold onto it and without the need for a light stand. In the previous package, I mentioned that you could use an umbrella to spread out the light from the flash to create softer, more even light. You can do something similar with a small external flash unit: get a diffuser. A diffuser is just a white piece of plastic that sits on top of the flash head - just make sure when you buy the diffuser that it's designed for YOUR flash since flash heads come in all sorts of shapes and sizes. Using a manufacturer-specific flash unit with your digital SLR camera is a great way to light a variety of subjects. Key benefits are that the flash is able to move with the camera (helpful for capturing subjects that won't stay still) and the flash circuitry is able to communicate with the camera for fully automatic balanced flash. The drawbacks are that these flashes are not interchangeable (if you buy a different brand SLR in the future) and - for the most part - the light produced by them always comes from the direction of the camera. For some, this will be a small price to pay for the versatility and ease-of-use of these types of external flash. The wired strobe option is for those who like the idea of an off-camera light source but are looking for something with more power than the Vivitar 285HV. For you, a strobe that's wired to the camera is the solution. The big difference here is that a light stand is a must. While you can get away with carting around the Vivitar 285HV in your hand, you're not going to be able to do the same thing with a big, heavy strobe — this type of lighting needs a stable base of support. The cons - relative to package #1 - are that this setup is not as portable and definitely cannot be moved around to keep up with a subject in motion. Once you plunk down the strobe on the light stand, it's pretty much there to stay. This issue is enhanced by the fact that a strobe must be plugged in to a wall socket in order to operate (while the smaller flash units run off of battery power). What you gain for this lack of mobility is a light that can light up an entire room — if that's what you need it to do. Strobes are what you'll find in use in most professional portrait studios. The photographer has figured out in advance where to place the lights for optimal results regardless of the size of the group being photographed. The strobes are set up to produce nice even lighting across all the subjects while reducing or even eliminating the appearance of dark shadows. There are two main extras that you can use with a wired strobe: one is a standard umbrella, like the Photek Softlighter ($60) listed above, and the other is a soft box. Unlike an umbrella that's distanced from the light source, a soft box completely encloses it. The translucent material of the soft box increases the effective size of the flash, which creates the type of light that the "soft box" name implies: gentle, even illumination. Soft boxes come in a variety of sizes, and the size of the box you need is relative to the subject you're photographing. To light a single portrait subject, you can use one that's relatively small, but if you really enjoy taking large group photos, then a larger box will create more even light for the entire group. The main benefit of moving up to a strobe from a small external flash is that you get a lot more power out of the light. A second benefit is that you can use a soft box (which cannot be attached to flashes that are smaller than a strobe) to create even portrait lighting even for small to medium-sized groups. The biggest drawbacks here relate to portability and mobility: strobes and softboxes are bulky and heavy and don't pack easily into a camera bag. Having to plug in the strobe means that you need to be in a location with a power outlet nearby, and once plugged in and positioned, you're not going to be moving the light around very much. Unlike the one-flash setups listed above, a two-light package will allow you to wrap the light around your subject, creating dimension and separating your subject from the background. Setups with multiple lights are most commonly used for portrait work, where you often have three lights: a main light, a light to fill in the shadows (called a "fill light") and one to highlight the subject's hair (called a "hair light"). Before you make the jump to three lights, get used to working with two first. The nice part about this SLR flash package is that it allows you to travel: there are no wires required to power the flash units. This setup is a bit more complicated than the others, so I'll walk through each one of the steps in order so you can get a sense of what's required to get everything connected. Phew! Now you're ready to take some photos. The connecting cord between the camera and the Vivitar flash tells the Vivitar to fire every time you press the shutter button on the camera. The Mobilight detects that the flash is going off and fires at the same time (but with no wires required from camera to flash nor the need for a power cord). 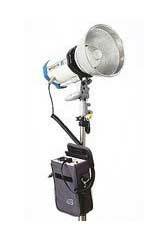 The nice part about this SLR flash package is that it provides you with a versatile on-location lighting setup. You won't need any power source nearby since both flashes run off battery power. You can use this setup in the middle of a field just as easily as you could in the middle of your living room. Since the camera is only tethered to the Vivitar flash, you can move the Mobilight around on its light stand to get just the type of coverage you are looking for. The two flashes gives you a lot more creative freedom than just one, allowing you to light your subject from two different angles. Finally, the amount of light put out by these two units is sufficient to light even a fairly large room if you find that you need to take some photos of interiors and don't want to work with the natural available light. 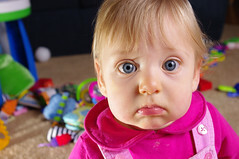 This photo of my daughter was taken in our living room. The Vivitar 285HV is sitting down on the ground off to the left, while the Mobilight is behind me to the right (lighting up her face). Given the low level of ambient light (this was taken at night) the extra flash helps to light up the side of her face that would otherwise be cast in shadow. If you really want to go completely wireless, then you're going to need to untether yourself from the Vivitar flash. The way to do that is with a device called a Pocket Wizard Plus II. This radio transmitter sends a signal to any other Pocket Wizards in the near vicinity, allowing you to trigger your flash without any cords running between the camera and the flash unit. The versatility here is enormous: now you can physically move yourself and the camera around, triggering your two-flash setup as you go. Unfortunately, you pay a hefty price tag for this advantage: a single Pocket Wizard Plus II will run you $184, and you'll need at least two of them - one to send the signal to fire the flash and the other to receive it. In addition, you'll need a special Pocket Wizard to Vivitar sync cord to fire the Vivitar flash or a Pocket Wizard to 1/4" Mono sync cord to set off the strobe. Finally, you can add a couple of umbrellas to the mix, which can be used with the Vivitar flash, the JTL Mobilight, or both. The main drawback is that flexibility comes with a price tag: $560 if you're willing to tether the camera to one of the flash units, and almost $1,000 if you want the full wireless setup. However, if you're looking to get more professional results with your flash photography - maybe even make a little cash taking on-location portraits, then this SLR flash package will get the job done and is relatively inexpensive when you compare it to some of the truly "professional" flash options out there (which can easily cost upwards of $3,000).